I saw this at lunch today, parked in the mechanic's garage next to my Jeep. First picture with my new phone camera. And I gotta tell ya. I am not usually prone to car lust, but this was a beauty. or whatever they run on. but I could not care less. ask you baby, you wanna ride in my car? ooooooh! They don't make 'em like that anymore! Yesss.....I love classic cars! 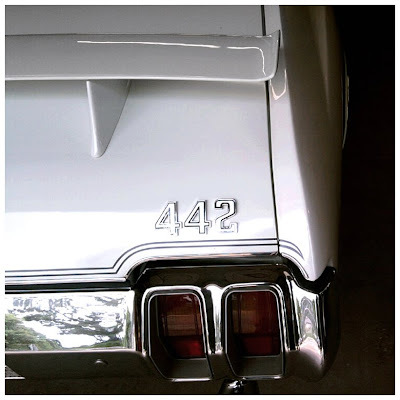 My uncle has had several 442's in his lifetime. Used to race one, I think it was about an '86 or so. He had a 1964 too! Too boxy for my liking (I should be a man, I LIKE the curves) but it was still a beautiful car. This one looks to me to be in the late 60's, early 70's to me. A 1969 Chevelle is my dream car! I was out taking pics of my garden today, things are starting to look good. Love you! :-)...I love this post. My husband restores classic cars. He currently has a 1969 Plymouth Roadrunner finished...and is working on a '56 Chev. Lovin' it! I love that silly movie Gone in 60 Seconds just for the cars. I vascilate between dream cars, too. Part of me desperately wants a bright orange thing. The other part longs for a black convertible 1962 Camero. Don't even ask me what I drive now. UGH. Oh oh oh! My first car was a Oldsmobile Cutlass, very similar to this baby. Beautiful and worthy of muscle car lust, oh yeah! I think there was an "old car show" in town yesterday. I found myself traveling down the road in the middle of a long line of really old ones..you know, like those old fashioned Fords? All I can say is they move REALLY SLOWLY.